Need a SUPER-FAST and yet totally yummy dinner on a busy weeknight? 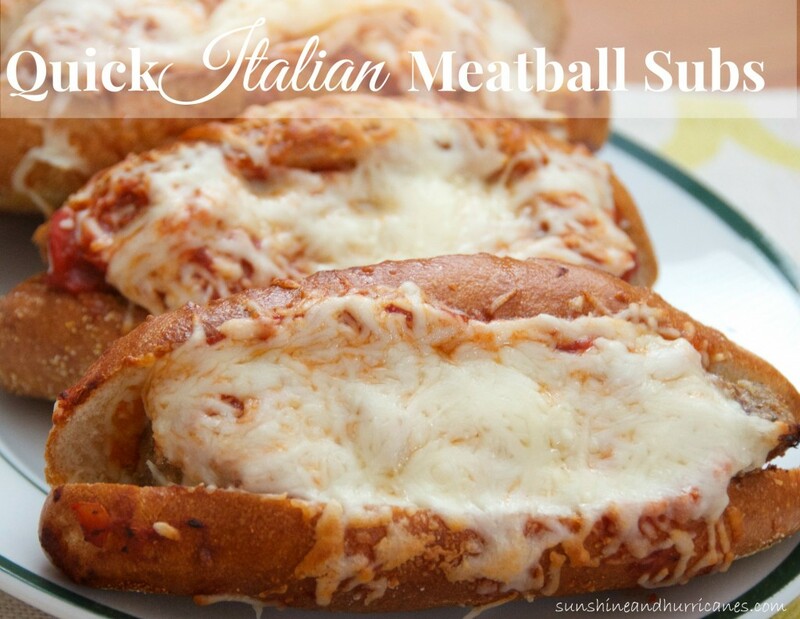 One of my favorite go-to meals has become meatball subs. 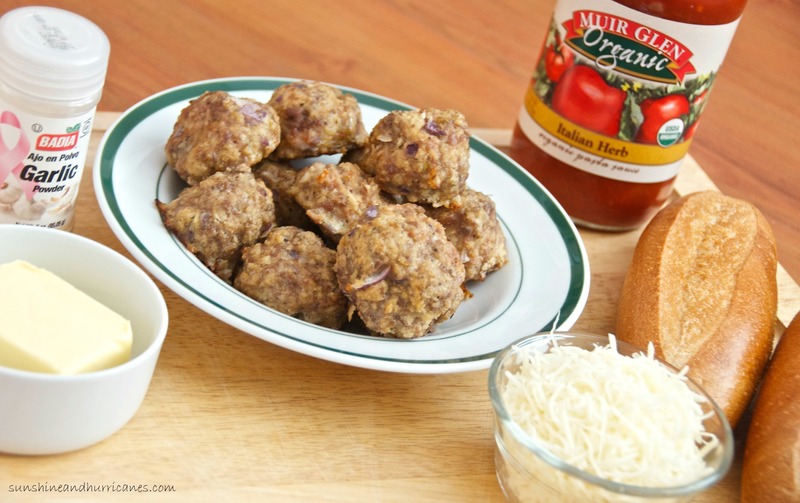 I like them because I can either use store-bought meatballs or I often whip up a double batch of these Easy Italian Meatballs and freeze extras to have on hand for meatball subs. That way I’m prepared for those crazy evenings when the kids have activities and I won’t have much time to cook. Preheat the oven to 350 degrees. Soften the butter slightly in the microwave and mix with the 2 tsp garlic powder. Slice open the Hoagie rolls, but don’t fully cut them in half. Split them apart just enough that you can spread a light layer of the garlic butter mixture on each side. Place 3-4 meatballs in each roll, top with about 1/4 -1/2 cup of sauce (this really depends on your own personal preference and how saucy you want them). Top each with mozzarella and place on a parchment paper lined cooking tray (or else use cooking spray). You can use the rolls to support each other so they don’t fall over spilling all their yummy goodness OR you could also use a shallow baking pan to help them stay put. Bake until the cheese gets melty and the rolls start to look a little brown and crispy (about 10 -12 minutes). I like to serve these with a little side salad or if you have broccoli lovers, that is also a good choice. Soften the butter slightly in the microwave and mix with the 2 tsp garlic powder. Slice open the Hoagie rolls, but don't fully cut them in half. Split them apart just enough that you can spread a light layer of the garlic butter mixture on each side. Place 3-4 meatballs in each roll, top with about ¼ -1/2 cup of sauce. Top each with mozzarella and place on a parchment paper lined cooking tray (or else use cooking spray). You can use the rolls to support each other so they don't fall over spilling all their yummy goodness OR you could also use a shallow baking pan to help them stay put. 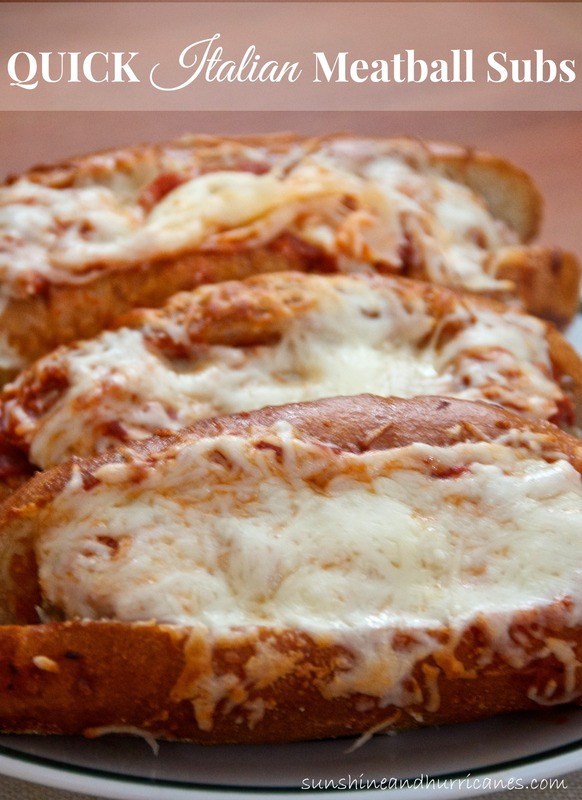 Bake until the cheese gets melty and the rolls start to look a little brown and crispy (about 10 -12 minutes). No where in this did it say the meatballs need to be cooked. I assumed since it said you could use frozen or make your own that you just put em in there raw.